Ice play is a huge hit in our house. The gap after school pick up and before tea can sometimes be a bit tricky to fill. 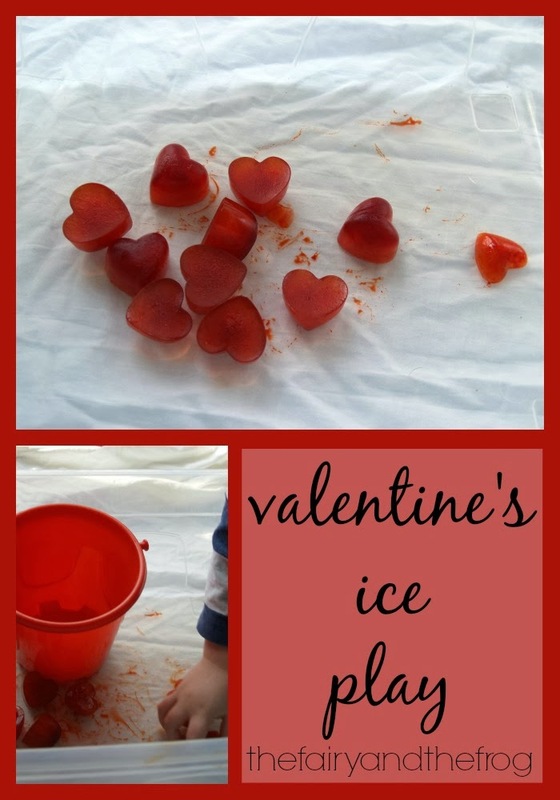 We often crash in front of the TV but I found these silicon ice moulds a the back of my cupboard and they inspired me to prepare some ice hearts to make a valentine's sensory box. I added a little food colouring to colour the water when making the hearts (I was worried this might stain so put sheets down - check your food colouring first to make sure). As both children (5 and 2) could join in at the same time it made for a calm afternoon! We had fun touching and taking about the ice, filing a bucket and thinking about what might happen next to the hearts (melting). 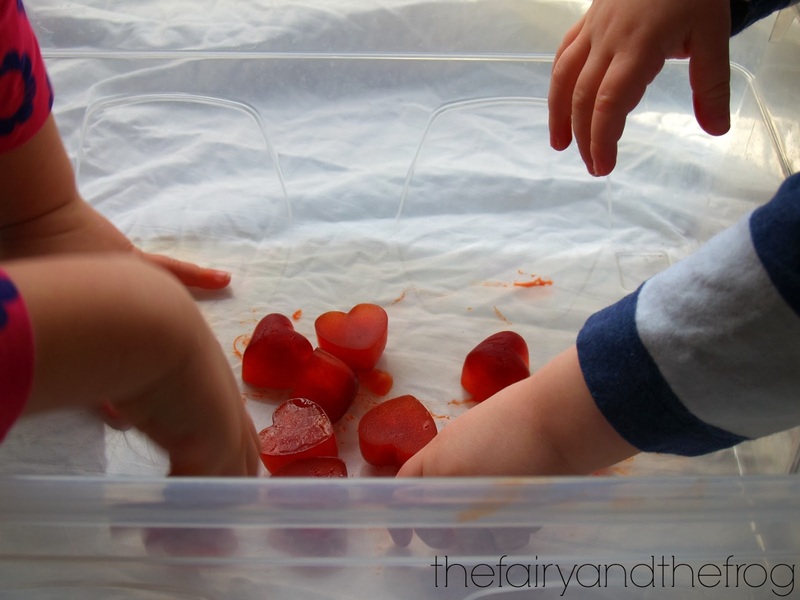 Dirt and boogers has done a similar activity and used jelly/ jello you can find it here. As with all activities make sure you supervise your child adequately. Ice cubes can be a choking hazard for small children. Language used: cold, shivery, melt, drip, red. If you like ice play you might like our polar ice sensory tub / pretend play scene or our ice decorations. This post is part of the Ultimate Guide to 50 Craft Materials; 50 different posts featuring 50 different craft materials. Glue is an essential craft material but often falls in the shadow of many other items (usually the items it is sticking) So today we are putting the spotlight on glue. 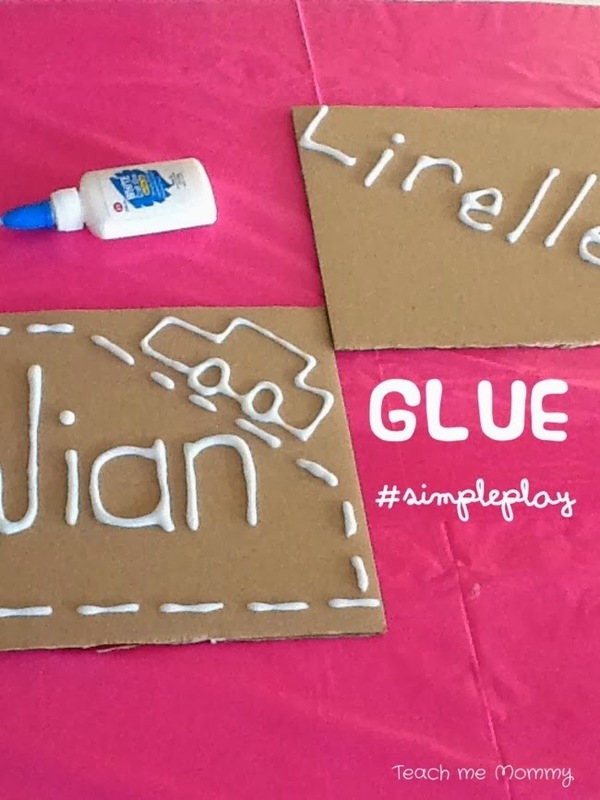 The most common use of glue is to stick two items together. Collages are great for children young and old. They can be as simple or complex as the child wants them to be. We especially like our Gaudi inspired snails. Sticking needn't stop at paper. You can transform an old glass jar into a lantern by sticking tissue paper on the outside. 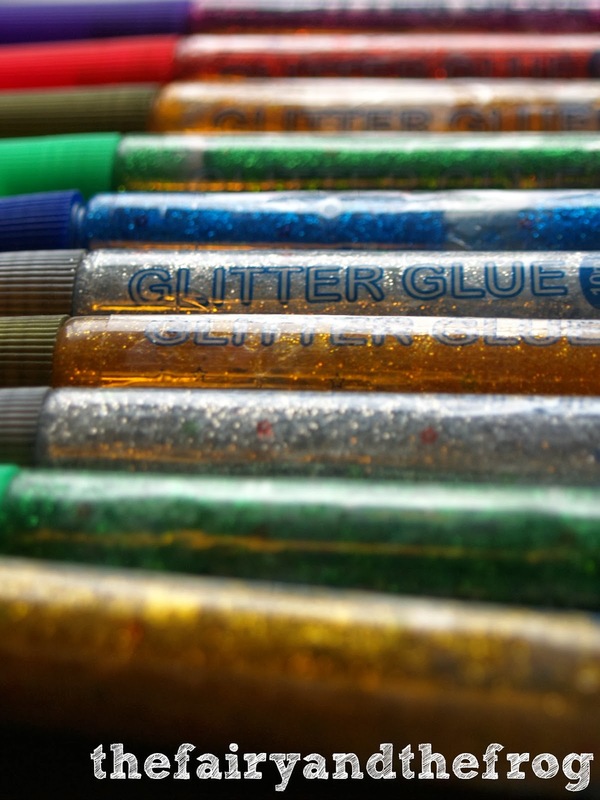 Glue not only acts as an adhesive but it can be decorative in it's self. 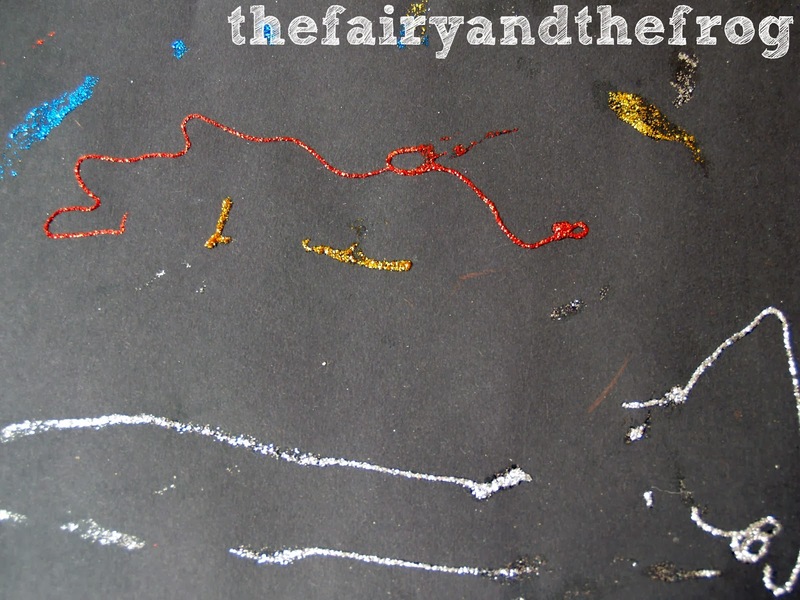 We loved making our glitter glue firework pictures earlier this month. These 'spider webs' canvases from Sun Hats and Wellie Boots are very cool. 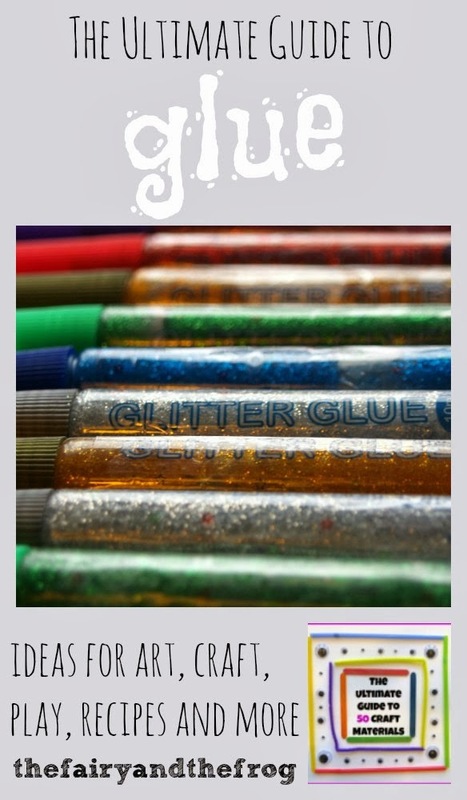 Glue resist painting can produce absolutely gorgeous results - especially when combined with watercolours and salt as in this post from Frugal fun for boys. Happy Hooligans also combined salt, glue and water colour (using a different method) and used it to teach name reconnection. Teach Me Mommy used glue pictures to create some crayon resist pictures. You can also make amazing glue prints using the resit technique as shown by Artespirit. Modge Podge/ watered down PVA glue can act as a cheap varnish. 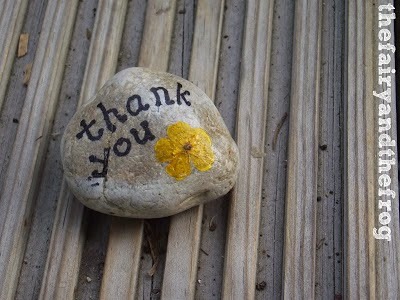 We use it when were are making salt dough decorations and when we made our pressed flower pebble you can see below. 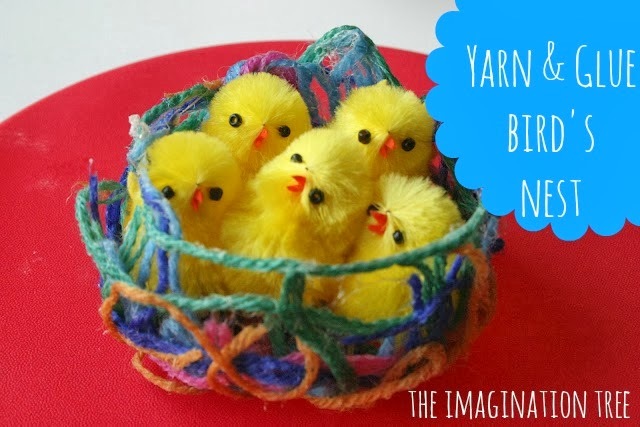 Glue can also be useful to strengthen materials and make them rigid like in this sweet yarn and birds nest from The Imagination Tree. 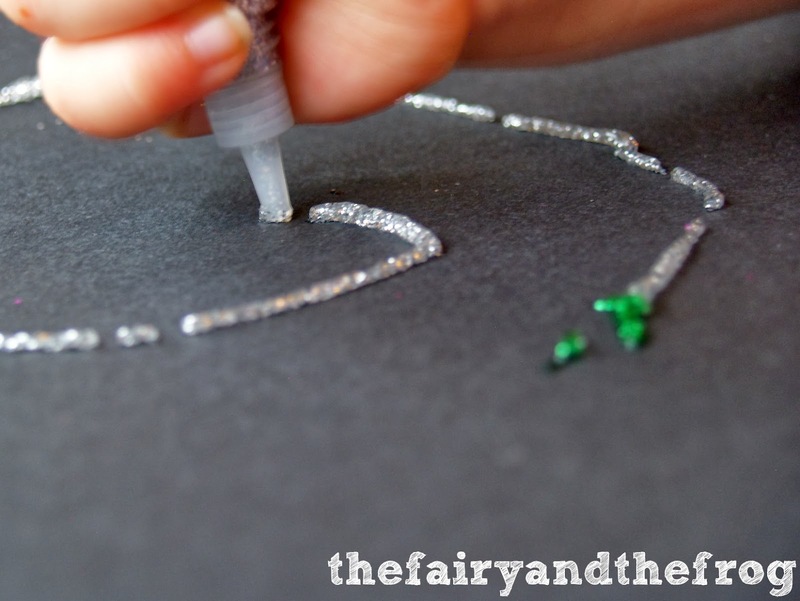 My Little 3 and Me used glue to stiffen a leaf when doing leaf threading. Regular readers will know that I am a massive playdough fan. Unsurprisingly I love this glue and corn starch (corn flour for UK readers) playdough recipe from Inspiration Laboratories. 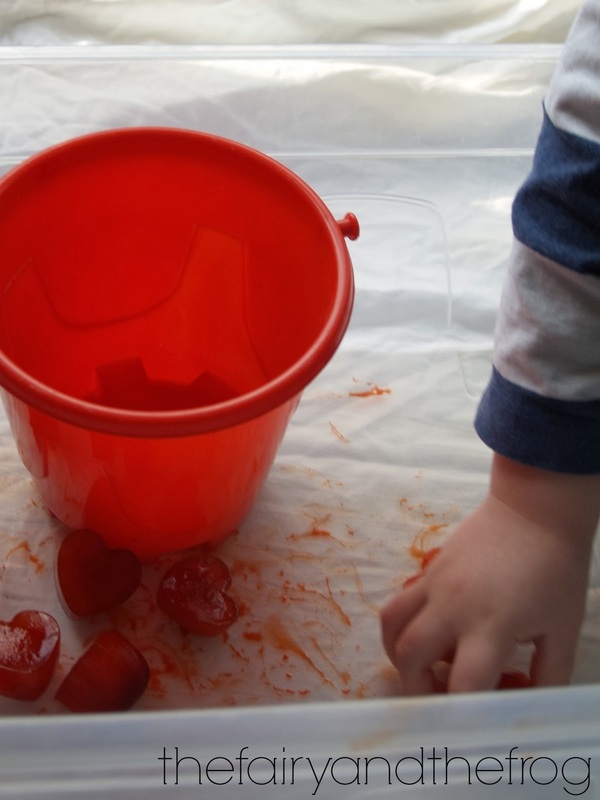 If you're a fan of sensory play then you will also love this recipe for jelly slime (containing glue) from Mama OT. How about making your own glue. If like me you're not always sure which glue should be used when I refer to this infographic. If you are a blogger and have any posts that prominently feature glue please link up below. How do you reinforce sight words with your child? In the UK (as in other parts of the world) children are taught a 'bank' of sight words to support reading along side learning synthetic phonetic (how to break down/ blend sounds to make words). Learning new words can take lots of exposure. The Fairy isn't always keen to just look at the words (and frankly neither am I - it is a bit boring) . So after asking for advice on 'The Fairy and The Frog' Facebook page I decided to shake things up (literally) by making a discovery bottle. By the way if you've not liked us over at Facebook please stop by and say hello we love having new followers just click here to find us. 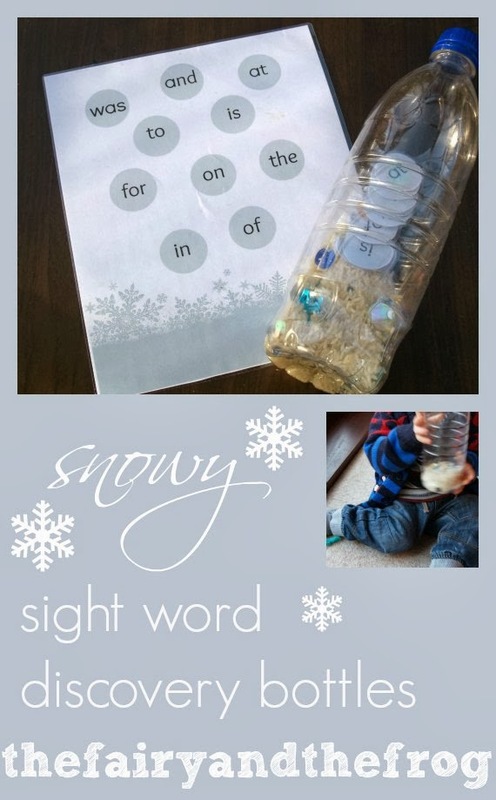 We made a sight word discovery bottle with an winter theme (chosen by the Fairy- I was surprised because I thought she'd automatically go for something pink related but obviously not). 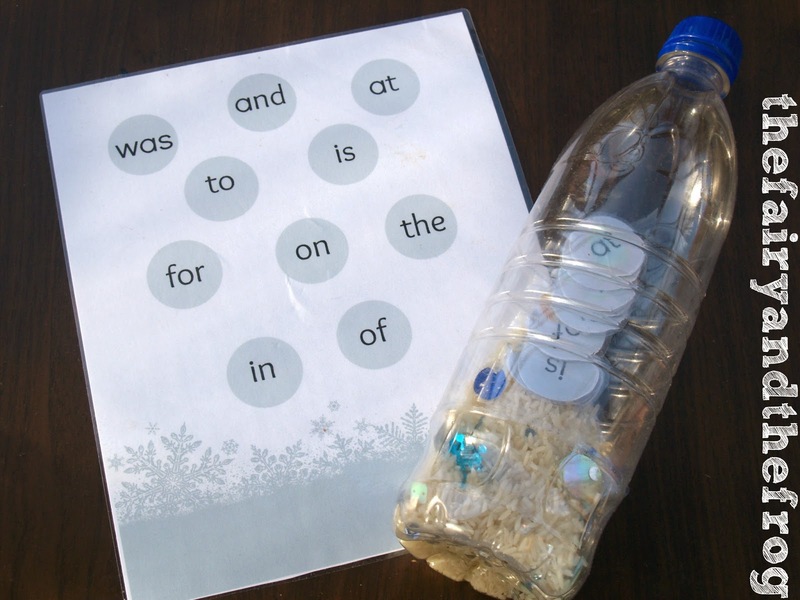 Discovery bottles are not a new idea (we've made lots before including our autumn discovery bottle) there are lots of examples on pinterest of people using them to support sight word learning including this one. 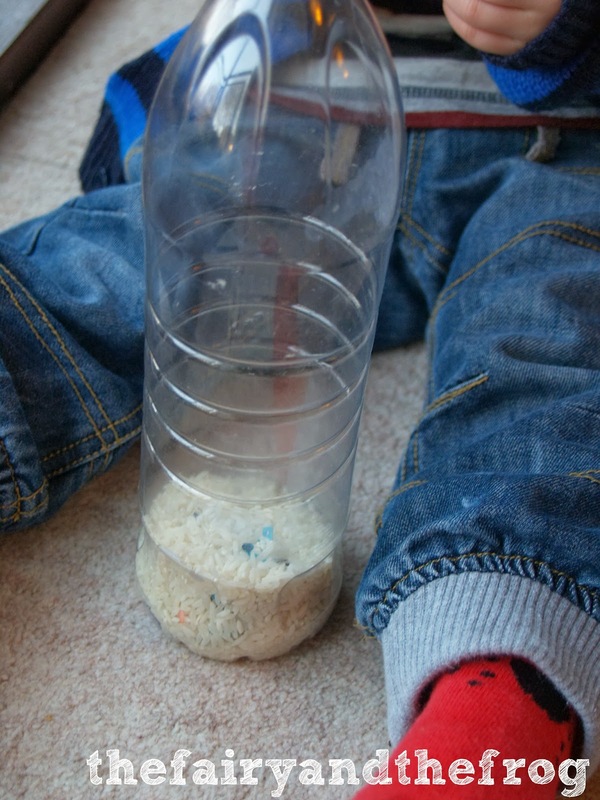 We made the discovery by adding some sight words (which I laminated to make stronger - this is optional) to a clean plastic bottle with some rice. The Fairy then selected 'cold' sequins from our 'sparkle jar'. Make sure you close the bottle tightly so little fingers can't open it (you may like to seal with glue to make extra sure). Juice/ smoothie bottles tend to have wider necks so they can be easier to add bits to. 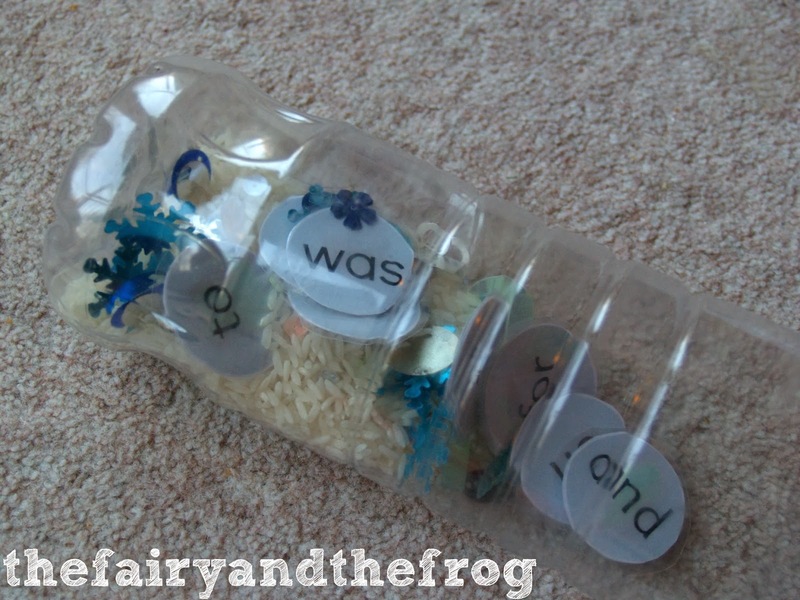 The words get hidden in the rice and sequins (as demonstrated here by The Frog who has temporally 'borrowed' the bottle whilst his big sis is at school). When you shake the bottle the words come to the surface. To help her use the bottle I designed a sheet on picmonkey adding some cold looking snowflakes (if you haven't already found it s a great photo editing website). The Fairy uses a felt tip to tick the words she can find and can read, She also circles the ones she's not sure about (I've laminated the sheet to make it reusable) so she can ask us to help her. This promotes independence and willingness to practice. 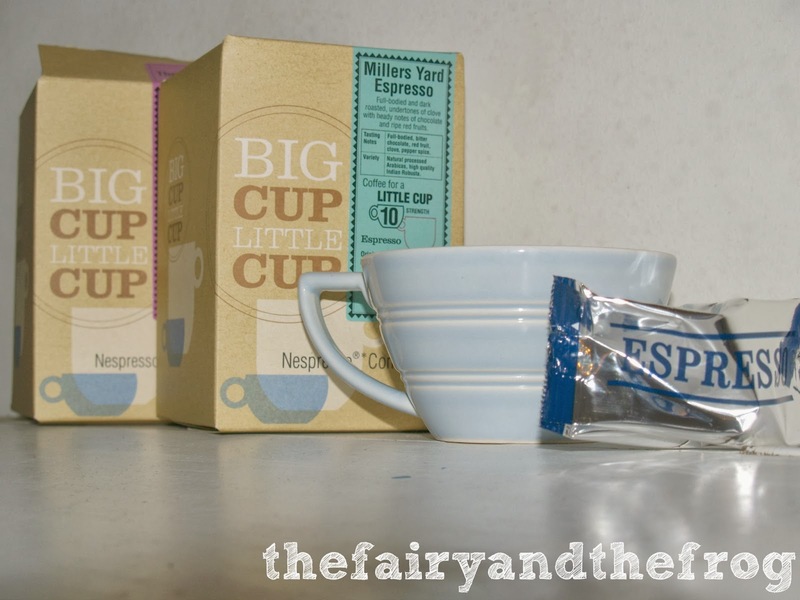 Big Cup Little Cup coffee review. I was sent a pack of Millers Yard (described as 'full bodied, bitter chocolate , red fruit, clove and pepper spice) and a pack of Thompson #9 (described as medium - full bodied, coco forest fruits, plum and almond). I don't claim to be a coffee connoisseur, but I am rather fond of an espresso at breakfast. I really enjoyed both of the types of coffee. I found the creme (the frothy bit on the top of the coffee) wasn't as consistent as with Nespresso brand capsules. The price is comparable to Nespresso capsules. A big plus for me is that Big Cup Little Cup capsules contain fairly traded coffee. Disclaimer: I was sent two boxes of capsules to review. All opinions are my own. 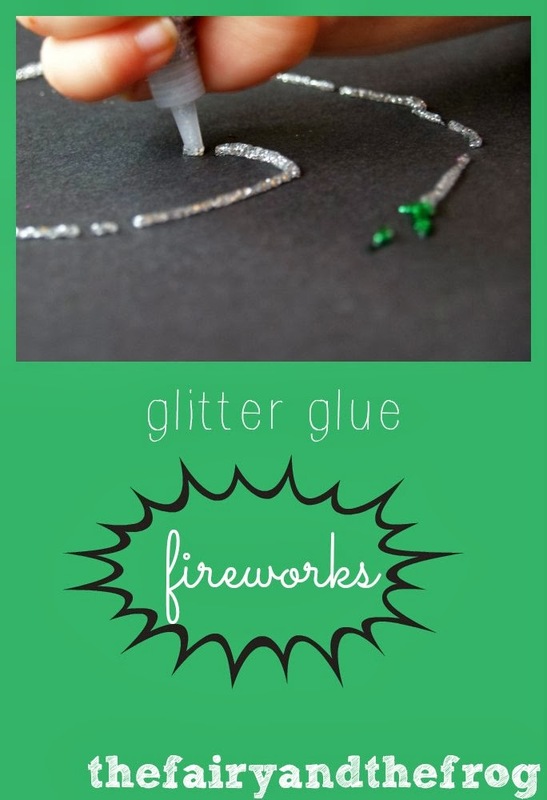 Have you tried making glitter glue fireworks? Ever since New Years Eve The Frog has been firework obsessed. This has included running around making 'whizz' and 'bang' noises. So I thought he might like a to experiment with a craft version. The shiny glue looks really effective on black card. This activity can be done with a wide age range of children, each learning at their level. 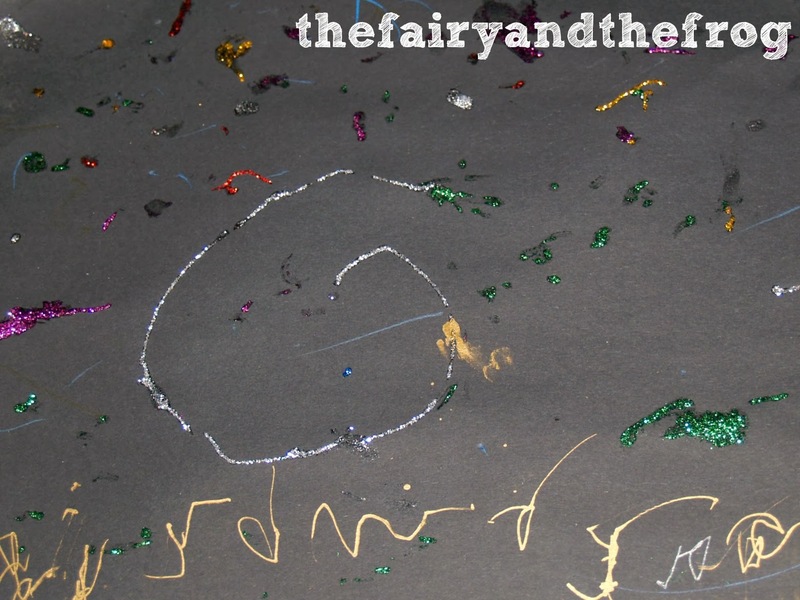 The Fairy wanted to add a 'firework' label using our favourite metallic pen. I've included an affiliate link for the pens in Amazon just in case you want to try them too (for those of you who are new to affiliate links it just means if you buy the product after clicking on the image I get paid a small percentage at no extra cost to you). Language links: shiny, colour, sound words e.g bang, pop, whizz (links to 'letters and sounds' phase 1, aspect 6 'voice sounds). If like me, today is the start of a new school term for your little one congratulations on surviving the school run! 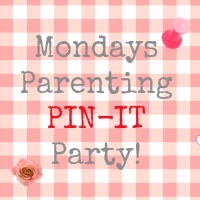 Put on the kettle, sit back and relax and enjoy the Monday Parenting Pin it Party. 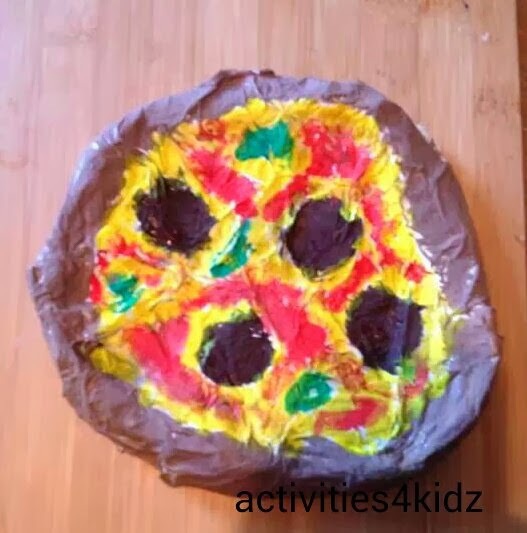 My fav pick from last week is this yummy papier mache pizza. Recycling and imaginative play in one. The Parenting Pin it Party is brought to you by Romanian Mum, Kiddy Charts, Mum of One and Mamasaurus. As its New Year we thought we'd like to start the year by re sharing our favourite post from 2013. We've chosen our owl babies story sack. 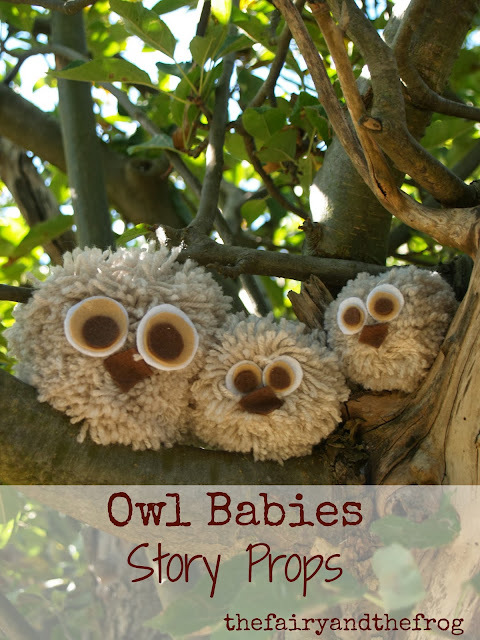 We love the owls as they so sweet and they get played with alot! Below you'll find over 50 Kid Blogger Network members coming together for The KBN Best Of 2013 Blog Hop. We know you'll find tons of wonderful ideas to browse, pin and share. 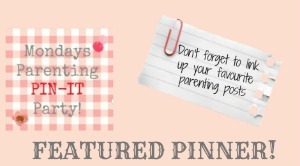 We'd love for you to join the blog hop and share your favorite activity of 2013 too, and make sure you're following the Kid Blogger Network on Pinterest. Powerful Mothering, The Good Long Road, All Done Monkey, Afterschool for Smarty Pants,B-Inspired Mama, Babble Dabble Do, Bits of Positivity, Boy Mama Teacher Mama, Caution! Twins at Play, Child Central Station, Creative Family Fun, Creative World of Varya, Cute and Peculiar, Dirt and Boogers, Edventures with Kids, The European Mama, The Eyes of a Boy, The Fairy and the Frog, Frogs and Snails and Puppy Dog Tails, Fun-A-Day!, Glittering Muffins, , Growing Book by Book, Hands on: as we grow, Here Come The Girls, iGame Mom, I Heart Crafty Things, Inspiration Laboratories, Kid World Citizen, Kiddie Foodies, Kids Yoga Stories, Kitchen Counter Chronicles, Lalymom, Lemon Lime Adventures, Let's Play Music, Living Montessori Now, Makeovers & Motherhood, Mama Smiles, Multicultural Kids Blog, My Little 3 and Me, P is for Preschooler, Peakle Pie, Pennies of Time, Playdough to Plato, PlayDrMom, Preschool Powol Packets, Racheous - Lovable Learning, Still Playing School, Smiling Like Sunshine, Stir the Wonder, Teach Me Mommy,Teach Preschool, There's Just One Mommy, Toddler Approved, True Aim Education, Tutus and Tea Parties, Where Imagination Grows, and Wildflower Ramblings.